31% women assaulted in the last 12 months were assaulted by a current or previous partner, 28% by a male family member or friend, 12% another male person. 78% of women who had been sexually assaulted since the age of 15 were assaulted by someone known to them. 74.9% of all assaults against women occurred in the home. Three times more likely to be injured as a result of violence. Five times more likely to require medical attention or hospitalisation. Five times more likely to report fearing for their lives (Statistics Canada 2003). One in three women had experienced physical violence since the age of 15. Nearly one in five women had experienced sexual violence since the age of 15. 16% of women had experienced violence by a current or previous partner since the age of 15. 36% of women who experienced partner violence were pregnant at the time of the violence. These figures do not include other forms of violence (such as emotional abuse and social and/or financial control). In Australia from 1989-98, 57% of female deaths resulting from homicide or violence, were perpetuated by an intimate partner. (Mouzos 1999). Intimate partner violence contributes 7.9% to the disease burden in Victorian women age 15-44 years, making it the largest known contributor to the preventable disease burden in this age bracket (VicHealth 2004). 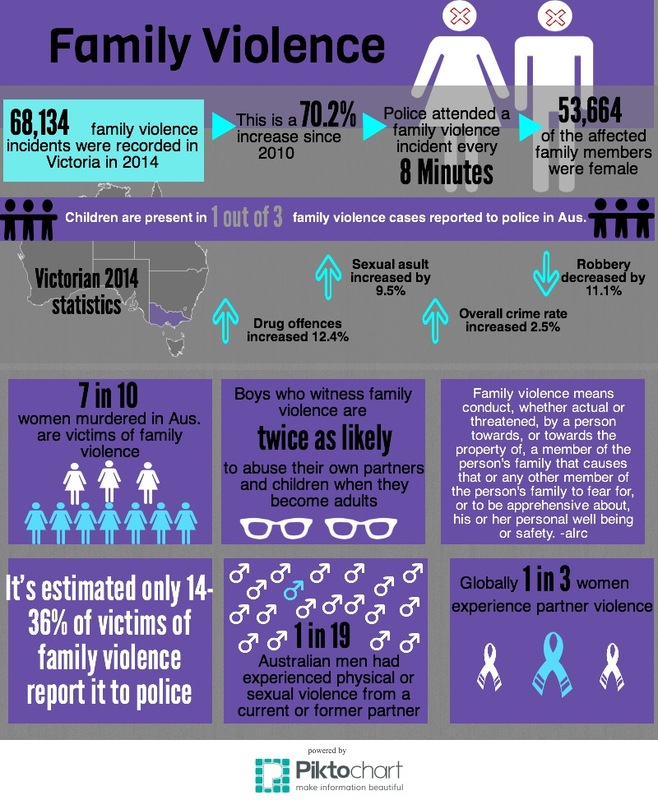 In the ABS Personal Safety Survey, 34% of women experiencing violence by a current partner and 39% of those by a former partner reported that the violence was witnessed by children in their care (ABS 2006). 97% of clients who needed emergency housing due to violence, were women (VicHealth 2004-2005). Violence against women has an estimated cost of $8.1 billion (Access Economics 2004).